Naturally you might think that your cat needs space to run around and play. This might even cause you to choose a pet sitter over boarding your kitty. But the truth is they love tight spaces. You may notice them practicing the motto “If I fits, I sits” as they squeeze themselves into a cardboard box that used to hold your shoes. Cats are pretty flexible so this practice won’t hurt them a bit. Why do they love tight spaces so much? Some believe that it’s a hiding mechanism. Cats are predators at heart, so they think they are hiding from other creatures when they stuff themselves into a tight space. This gives them a sense of control over their environment, in the same way that sitting in high places allows them to watch everything. Others think that it has something to do with comfort. You may be thinking “Most people who do yoga on a regular basis can’t get into that shape!” Between their flexibility and their clever nature, they use these things to their advantage. By curling up in that bowl, they are getting a similar feeling to a child being tucked in at night before they drift off to sleep. Another theory is because they tend to feel warmer in these confined areas. Cat’s love being warm- just leave your laptop on for a little while and see what happens. 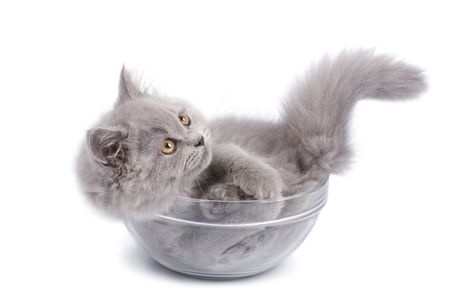 If your cat finds a container with at least three sides to it, then it will probably get comfortable in there. For those who need to travel, board, or keep their kitty in a carrier, this is excellent news. They won’t see it as some sort of jail or confinement. They will appreciate the small space and might find it easier to relax. Keeping them in a cat townhouse at the vet, groomers, or kennel won’t be as stressful for them as you might think. 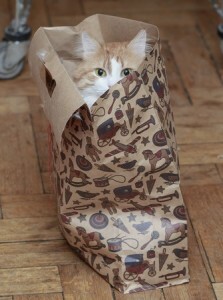 Include a couple kitty belongings and you will be all set!